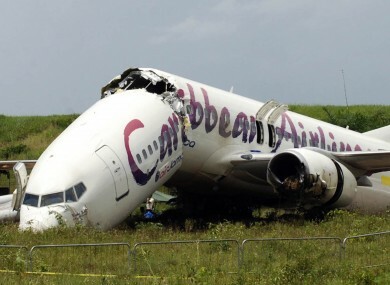 Amazingly, no one on board this Caribbean Airlines plane died following a crash landing in Guyana. A JET CARRYING 163 people broke in two as it crash landed in the South American country of Guyana on Saturday but incredibly no one was killed and the worst injury was a broken leg. Caribbean Airlines flight 523 from New York had just touched down at the international airport in Georgetown in the tiny country of Guyana with passengers applauding the pilot’s manoeuvres seconds before the Boeing 737-800 series aircraft slid off the end of a rainy and wet runway. The plane crashed through a chain-link fence and barely missed a 200-foot ravine. Had it not stopped and gone over the edge, many on board would have died according to officials. “It’s an absolute miracle what happened here in Georgetown,” said Caribbean Airlines chairman George Nicholas, as he visited the crash site where the jet had split into two, reports Mail Online. More than 30 passengers were hospitalised but mostly with minor injuries. The worst was a broken leg. Investigators are probing whether the plane came down too close to the end of the 7,000 foot long runway, according to the New York Daily News which adds that the pilot who landed the plane had flown into the airport regularly over the last 25 years. Email “In pictures: cheers turn to screams as plane breaks in two ”. Feedback on “In pictures: cheers turn to screams as plane breaks in two ”.